A fully-automated solution with consistent replication of any types of workloads, ability to run unlimited number of test migrations and orchestrated launch of business applications on a target site. Enterprise-grade RPO and RTO values for consistent business application replication and cross-hypervisor Disaster Recovery to OpenStack / KVM and Amazon Web Services. 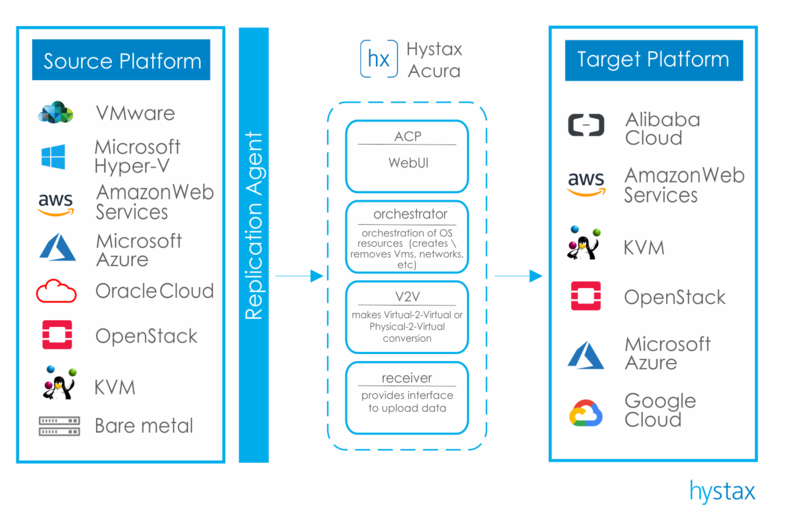 Hystax Acura will accelerate your sales by offering such services as migration to public, private or hybrid cloud and by providing Disaster Recovery as a Service. The fully-automated solution supports all target and source platforms and helps to implement any cloud migration strategy to modernize IT infrastructure.